At the GMIS International Conference 2011 in Santa Fe New Mexico was decided that our well-known international director Doug Taylor is followed by Clark Rainer. 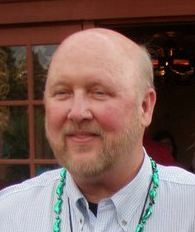 Clark is the current president of the Georgia chapter and is Director of Technology Services at Henry County. Clark will be attending the international LOLA meetings from now on. We want to thank Doug Taylor for his never ending effort in his work for LOLA and wish him all the best in the future, hoping to see him as much as we can during LOLA events.